All are welcome to join us on Sunday mornings at 10:30 am. Come as you are. Children participate in the beginning of the worship service with the whole congregation where they sing songs, greet one another, and participate in the "Children's Time', a short children's sermon in the sanctuary. They are then invited downstairs to finish the worship hour. Upon entering the children's worship center, they participate in a Godly Play style story. A story from scripture or church tradition is presented, and children and leaders together ask "wondering" questions about the story. "I wonder what your favorite part of the story is?... I wonder how the disciples felt when they heard Jesus say..." Worship continues with a time for responding to the story through activities. Then the time concludes back together for a feast and blessing as they children leave. We create a welcoming space for junior and high school youth. Summer mission trips, Triennium (National gathering of PCUSA) and fun are all mixed up together. Middle School and High School students are invited to worship with adults during the 10:30 worship service every Sunday. Youth 7th grade and older may also choose to serve in Children's Worship. Talk with Alex. An adult small group meets at 9:30 on periodic Sundays before the worship service. This is a chance to delve more deeply into Scripture, Christian faith and contemporary issues of justice and peace. If you would like a schedule and more information, contact Pastor Tiare Mathison at wallpcpastor@gmail.org. 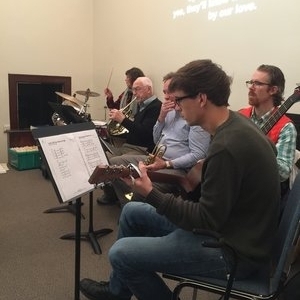 Our band is made up of congregation volunteers who practice together every Thursday night.